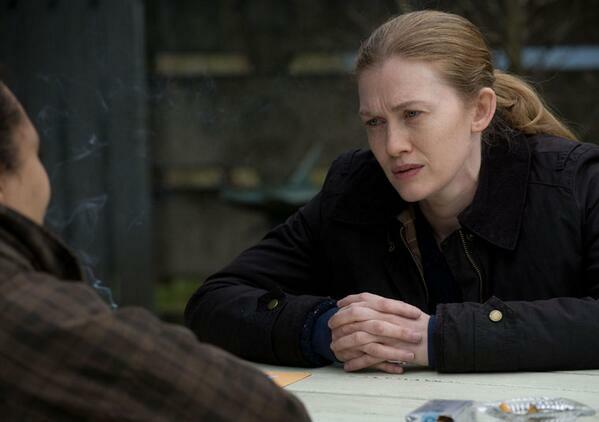 AMC’s murder-mystery series, The Killing, has been saved for the third time since its debut – this time, by Netflix. The media giant has become known of late for the production of its own original series’, such as Orange is the New Black, and House of Cards. They are now set to produce a fourth and “final season” of The Killing with the series’ original writers and crew, as well as main characters. The show centers around two homicide detectives, partners Sarah Linden (Mireille Enos) and Stephen Holder (Joel Kinnaman). Since the series’ debut in April 2011, it has experienced a roller coaster of both high and low ratings and number of viewers. The first season saw an audience of 1.8 million. However, after the season finale disappointed many viewers and fans by not solving its original case – the death of young Rosie Larsen – the second season saw a substantial lapse in viewers with an overall audience of only 1.53 million. After the drop in its second season, AMC canceled the show; it then decided differently, gaining some of its audience back for the third season. However, it was not enough to save the show, and AMC and Fox Television Studios struck a deal with Netflix after their final cut of the show in September. The fourth and final season of The Killing is scheduled to begin production in February in Canada, shooting the season’s six episodes. It is said to be focusing on a fresh case for Linden and Holder, though a premiere date has not been announced. Main image courtesy AMC via Twitter.